These are heady days, in the stock markets. My friends point out that I am being too conservative and thereby denying them easy pickings in the stock markets. Whether it is shares of an overpriced retail chain or a smokestack commodity company, prices are defying gravity. The headline indices do not reflect the mid-cap and small-cap mania that is going on in this market. Equity benchmark indices started off the first day of the week on a firm note tracking positive macro-economic data. Appreciation of the rupee against the US dollar also supported the firm opening of the equity markets, according to market analysts. Most banking stocks traded with firm sentiments lead by Kotak Bank. Auto, power, oil-gas and cement sector stocks complemented the firmness of the markets, pointed our market analysts. In a survey conducted during March and April 2017, industry chamber Federation of Indian Chambers of Commerce and Industry (FICCI) predicted India's gross domestic product (GDP) growth will be around 7.4% for fiscal 2017-18, with a minimum and maximum level of 7% and 7.6% respectively. Reasoning out the growth, FICCI's Economic Outlook Survey said: "While agricultural sector is estimated to clock 3.5% growth in 2017-18; the pick-up in overall GDP growth will also be supported by an improvement in industry and services sector growth. The industry and services sector are expected to grow by 6.9% and 8.4% respectively in 2017-18.” The survey was conducted amongst economists belonging to the industry, banking and financial services sector and the participants feel that with the process of re-monetisation almost complete, consumption activity has witnessed an uptick and will further build up going ahead. Also, the India Meteorological Department's latest forecast of monsoon arriving on time and being sufficient provides some reprieve amidst earlier reports of the El Nino having a dampening effect this year. Overall, macroeconomic trends in India project a long term bullish trend in the Indian stock markets. Thousands of commuters in Tamil Nadu were stranded on Monday as transport workers unions began an indefinite strike pressing for higher wages. The transport corporation workers unions began their indefinite strike from Sunday midnight to press for higher wages and perks to combat rising inflation and price rise. Very few staff members arrived for duty at the bus depots, resulting in most of the long-distance inter-state public transport services getting crippled. On Monday, students who had to appear for an examination at 10 a.m. lamented as their daily commute took around two hours. Listed corporate entities with manufacturing facilities in Tamil Nadu are likely to vibrate in line with the labour and infrastructure problems in the state and show poorer quarterly corporate earnings. China's retail sales, a key indicator of consumption, grew 10.7% year on year in April, 0.2 percentage points slower than the March level, official data showed on Monday. Total retail sales of consumer goods hit 2.73 trillion yuan ($395.4 billion) last month, Xinhua news agency cited the National Bureau of Statistics (NBS) as saying. It increased 0.79% month on month. In the first four months, total retail sales of consumer goods rose 10.2% year on year, 0.2% points faster than the growth in the first quarter, according to Xing Zhihong, a spokesperson with the NBS. Consumption activities were relatively stronger in rural areas, with retail sales expanding 12.6% in April, outpacing urban areas, where retail sales climbed 10.4% year on year. Online spending was robust. From January to April, online retail sales surged 32% year on year to 1.92 trillion yuan. Xing said the April figure indicates continued expansion of domestic consumer demand, which was partly driven by consumption upgrades and new business patterns such as online sales. China is trying to shift its economy toward a growth model driven by consumer spending, innovation and services, while weaning it off reliance on exports and investment. Chinese stock market indices are on a long term bullish trend and are important to the Indian stock markets as they close early in the trading day for our stock markets. Positive global cues, a strong rupee and healthy buying in banking, automobile and consumer durables stocks lifted the Indian equity markets during the mid-afternoon trade session on Monday. The BSE market breadth was bullish -- with 1,577 advances and 988 declines. The equity benchmark indices started off the first day of the week on a firm note tracking positive global cues. Appreciation of the Indian rupee against the US dollar also supported the firmness. Banking stocks resumed the firmness on strong buying support, pointed out market analysts. Most IT (information technology) sector stocks traded with firm sentiments, while aviation sector stocks extended previous session's gain on strong buying support. On the NSE, there were 913 advances, 569 declines and 82 unchanged. Tata Global Beverages on Monday said it proposes to launch a ready-to-drink tea-based beverage, Tata Tea Fruski on May 10. It added that the product will cater to the domestic market only. The company’s shares closed at Rs152.75, up 0.46% on the BSE. German auto component major Bosch Ltd on Monday resumed operations at its two manufacturing plants near a polluted lake in Bengaluru after a two-day shut down on the directive of the state pollution control watchdog. The company on Saturday temporarily closed its twin plants located in the vicinity of the 910-acre polluted Bellandur lake in the city's south-east suburbs on the Board's notice against it and other firms in its catchment areas. Asserting that it had the highest standards to protect the environment, Bosch said it was confident of operating the plants within the prescribed norms. Bosch’s shares closed at 23,300, up 0.15% on the BSE. The major indices of the Indian stock markets were narrowly range-bound on Tuesday and ended flat. On the NSE, there were 826 advances, 659 declines and 86 unchanged. The BSE market breadth was bullish, with 1,477 advances and 1,355 declines. State-run Vijaya Bank on Tuesday reported a net profit of Rs204 crore for the fourth quarter of the financial year 2016-17, registering a whopping 187% year-on-year (YoY) jump from R 71 crore in the like period a year ago. In a regulatory filing in the BSE, the city-based bank said net profit for the fiscal 2016-17 shot up 97% YoY to Rs751 crore from Rs382 crore in the previous fiscal year 2015-16. Operating profit for the quarter under review (Q4) also zoomed 129% YoY to Rs703 crore from Rs314 crore in the same period a year ago and 56% YoY for the fiscal 2017 to Rs2,421 crore from Rs1,549 crore, said the filing. Total income for Q4, however, increased 8.6% YoY to Rs3,505 crore from Rs3,229 crore in the corresponding period a year ago and 8.3% YoY for the fiscal 2017 to Rs14,031 crore from Rs12,957 crore in FY 2016. "Interest earned for Q4 grew 3.4% YoY to Rs3,055 crore from Rs2,956 crore in the same period a year ago and 2.4% YoY for the fiscal 2017 to Rs12,380 crore from Rs12,084 crore in FY 2016," it said. Vijaya Bank shares closed at Rs92.25, up 4.36% on the BSE. Industrial technology major ABB India reported an increase of 3.18% in its net profit for the first quarter (Q1) of 2017 from Rs85.45 crore to Rs88.17 crore. Besides, the firm's total income edged-up by 9.29% during the quarter under review to Rs2,337.36 crore from Rs2,138.53 crore earned during Q1 of last year. ABB India disclosed a significant y-o-y (Year-on-Year) increase in its orders book during the period under review, driven by government initiatives and investments. The company revealed that it has received orders worth Rs2,342 crore during the first quarter and had an order backlog of Rs12,023 crore, as on March 31, 2017. "We have continued to grow in a market of select sectoral growth with a keen focus on cash and cost with a view to deliver value-additions to our customers," said Sanjeev Sharma, CEO and Managing Director, ABB India. "The traction in transportation and infrastructure has led to us to deliver multiple projects of national importance." On Tuesday, ABB India shares closed at Rs1,537.80, up 9.71% on the BSE. With the IMD's (Indian Meteorological Department) prediction of 100% rainfall giving a boost to investors' sentiments, the Indian equity markets zoomed higher during the mid-afternoon trade session on Wednesday. The benchmark indices touched record intra-day high levels, as positive global cues and buying in automobile, capital goods and FMCG (fast moving consumer goods) stocks, too, supported the upward trajectory. On the NSE, there were 917 advances, 569 declines and 97 unchanged. The BSE market breadth was bullish, with 1,560 advances and 1,054 declines. The equity benchmark indices started off the day on a firm note tracking positive Asian cues, with the CNX Nifty hitting fresh all time high levels during the morning session. IT (information technology) and banking sector stocks currently traded with mixed sentiments due to profit booking at higher levels, while media-entertainment and power sector stocks complimented the firmness of the markets, pointed out market analysts. Bharti Airtel's net profit dropped by 71.7% to Rs373 crore in the fourth quarter of 2016-17 as compared to Rs1,319 crore in the corresponding period in previous fiscal with the mounting competition from Reliance Jio, a company statement said on Tuesday. "The sustained predatory pricing by the new operator has led to a decline in revenue growth for the second quarter in a row. The telecom industry as a whole also witnessed a revenue decline for the first time ever on a full year basis. The deteriorating health of the industry was compounded by the tsunami of incoming voice traffic from the new operator as a result of which significant investments had to be made just to carry the incoming traffic on our network," Gopal Vittal, MD and CEO, India and South Asia, said in a statement. The company's overall customer base in the fourth quarter stood at 372.4 million across 17 countries, up 8.5% as compared to the corresponding period in 2015-16. However, on Wednesday, the company’s shares closed at Rs372.70, up 7.87% on the BSE. The major indices of the Indian stock markets were range-bound on Thursday and ended flat, compared to Wednesday’s close. On the NSE, there were 572 advances, 910 declines and 55 unchanged. On the BSE, there were 1,247 advances, 1,583 declines and 162 unchanged. Market observers pointed out that the upward trajectory of the key indices was backed by healthy monsoon forecast and buying in automobile, banking and metal stocks. The equity benchmark indices started on a firm note and continued their run tracking positive Asian cues and appreciation of the rupee against the US dollar. Both the indices hit fresh all-time highs in the morning session. Good corporate earnings, sustained fund inflows and normal monsoon forecast supported the firm sentiments, pointed our market analysts. 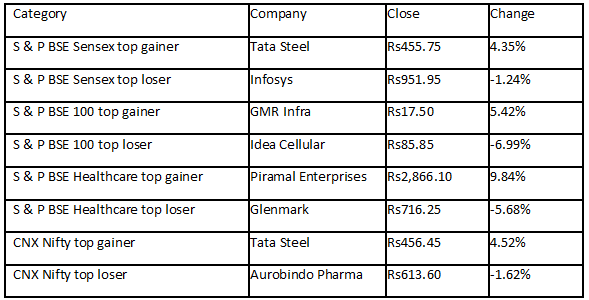 Most banking stocks traded with firm sentiments lead by Canara Bank, Bank of India and Bank of Baroda. Realty, media-entertainment and cement sector stocks complemented the firmness of the equity markets, observed market analysts. On Thursday, bucking the trend, global software major Tata Consultancy Services (TCS) has ruled out laying-off employees in the near future and instead plans to create more jobs. "No, certainly no," Rajesh Gopinathan, CEO and MD of TCS, told IANS here on Thursday when asked if there were any plans of laying-off employees or downsize as some other big players in India's IT sector have said they would do. "We are here to create jobs, not to downsize," he asserted after TCS launched a BPO centre here to create new opportunities as part of the government's Digital India push. TCS’ shares closed at Rs2,351.25, up 0.80% on the BSE. Indian equity markets on Friday slipped as investors were cautious ahead of the release of major domestic macro-economic data. Sentiments were hampered by negative global cues and selling pressure in banking, consumer durables and healthcare stocks. Overall, the major indices of the Indian stock markets were range-bound on Friday and closed with small losses over Thursday’s close. On the NSE, there were 437 advances, 1,053 declines and 57 unchanged.